Being from the Land of Lincoln (or as the guide at the Shiloh Battle Ground called it Land of Douglas preferring not to say the “L” word) my husband and I are interested in most things to do with the Civil War. When I learned that there was Confederate Whitehouse, an executive mansion where Jefferson Davis and his family resided during the War Between the States, I had to go see it. Located in the heart of downtown Montgomery and accross from the Capital where Jefferson Davis took office, the 6,000 square foot Italianate style house built in 1835 is a lovely place with room for the Davis family consisting of Davis, his wife Varina and their three children to live, entertain and for Davis to have meetings in the expansive study. The next step after electing a President was to provide a place to live and on February 21, 1861, the Provisional Congress authorized the leasing of a Confederate Executive Mansion. Money seemed to flow free because the house selected belonged to Colonel Edmund S. Harrison, who offered up the home that had been recently renovated by the previous owner Joseph Winter, for rent for $5.000 a year. While the house was completely furnished and staffed this was still a staggering amount for 1861. 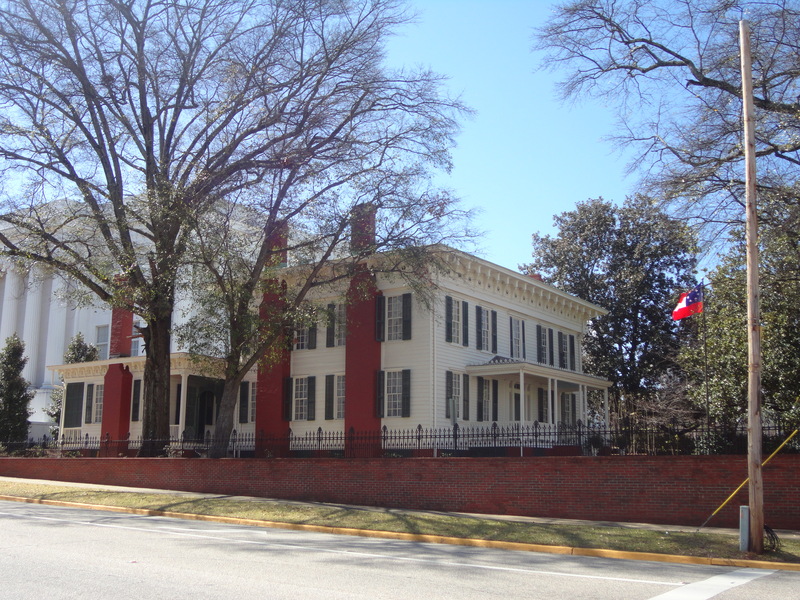 President Jefferson Davis, his second wife Varina Anne Howell Davis, and their children lived here from February 1861 until late May 1861, when the Confederate capital moved to Richmond, Virginia. For more information, call 334-242-1861 or visit www.firstwhitehouse.org. If you visit and are looking for a great place to eat, the Plaza is nearby and the Plaza Grill although basically a cafeteria served up some amazing southern fare!